Growing up, I was raised to be there for your family. In the end, they are the ones that have your back. I never realized family could be the downfall for some people, as mine were such a good part of my life. My mom, dad, brother and sister are my best of friends. They mean the world to me to this day, just as it was for my mother. She has always been close to her mom and dad, my grandma and grandpa. Two people who shined through so bright as a child that I would be excited with just the mention of them. My grandma, Evelyn Mahin, became a friend like none other as she was the anchor that I could rely on when I needed an ear. We were lucky that she was a local call, since even before I knew how to make a phone call, she was my very first call. My mother came home one day to find me on the phone, she asked me who I was talking to and I replied “Guys”, that’s what I called my grandma and grandpa at the time. My mom laughed and took the phone thinking I was making it up, though to her surprise my grandma was on the phone. She asked if grandma called me, with the reply that she didn’t my mother was confused until my dad returned home to teach her of the redial button. A few years later, my grandma’s phone number became the first number I ever memorized. This is when it started, I was only five years old and I began to call my grandma everyday. We’d talk for a half hour to an hour on the phone. I’d tell her about the TV I watched, what drawing I did, who I played with, where we went, anything and everything was fair game to talk about in these calls. An outlet, for a hyper child who loved to share her life. When school started up, these calls turned from fun into one of the most important things I could do for myself as a child. School went from bad to worse as children outcasted me at a really young age. I was no different from the other children at my school at the time, as I loved things other girls did. Care Bears, Pretty Pony’s , She-Ra and Rainbow Bright. Though there was a child in my class who did not like me. He got his friends not to like me, they got their friends, and they got their older sisters and brothers. This went around till the hatred was not just my elementary school, but most of the surrounding area. At first it was just name calling, which did hurt. Though I had a phone call to come home to, that would make me forget those name callings. I had my grandma to make me laugh and go on with my life as if that school day did not happen. By third grade though, things got worse, the children who use to just call me names started to attack me, ganging up on me. Now I know things could of gone really bad for me at this time. But with my family as my friends, I had people to look to, those who meant the world to me. My mother, a strong caring person who fought hard to keep me safe. My dad, a creative and wonderful man who worked hard to keep a roof over the family head. My sister and brother, who both took a lot of grief at school just for having me as a sister, though remained by my side. Then there was my back bone, my grandma. I would come home from these fights, broken, in tears, black eyes, bloody nose, or a fat lip. I would call up my Grandma and within a half hour she would get my laughing. I would tell her my full day at school, we called it my daily. By releasing my feelings over the phone to her, I had no reason to be sad when off the phone and would go on with my life. Playing with the kids on my street, watching cartoons, doing home work, or just enjoying family time. My grandma helped me keep my sanity during the worst of times. When I got into sixth grade, my mom took me out of the school where the problems were coming from by changing my address to my grandma and grandpa’s address. I would still be at home daily, though I would spend a lot of time at my grandma’s house. I had the best school year of my life, though we did learn I was not the only child that was transferred to this school for the same reason. My home town was never nice, and other children knew what I was going through. I was always lucky though, I had my family there to hold me up through these hard times. In Junior High, I merged back into class with the children that were hurting me and it wasn’t long before they tried to start this back up. My mom stepped in and got me into karate, where I was able to learn to defend myself. The fighting stopped soon after, though the name calling and distance attacks when my back was turned remained a part of my life with school all the way through 12th grade. While this remained a part of my life, so did my grandma. My daily phone call, that kept me light hearted. Her kind words, would pull me from any chances of falling into a depression. 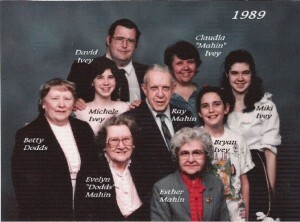 In 1996, we lost my grandpa, a hard lost as he too would talk to me on the phone daily. He was close to everyone in the family and just as caring. While crushed, I knew this was hard for both his sister and my grandma, so I worked to remain strong for them. I would come and help at my grandma’s house when ever she needed me. I would visit her often. She truly was a huge part of my life, as I still called her everyday. In 2001, my grandma contracted cancer. She went into surgery 5 years to the day that my grandpa passed away and pulled through. She originally made a fast recovery, though in 2002 she came down sick again. My mom remained by her side, helping her through everything as much as she could, moving in and deciding the rest of the family was going to move in to help as well. I was working 68 Hours a week at a factory, when she came down worse in the summer of 2003. So I was not able to be there as much as I wanted to be as help. Though I talked to her everyday on the phone, and would always come by to see how she was doing. We lost her August that year. A lost that I feel everyday, as if a part of me went with her to keep her safe. There is a empty space inside of me. My grandma’s laughter was something to be heard, the happy feelings that she shared with all who met her would ring through the air. She knew how to make sure even at the worse of times, you remembered to smile. She was only human, like the rest of us, but she knew how to remind me that humans are all good deep down. My grandma was one of the many lights in my life to help me, to hold me, to love me and remind me that there’s more to life than games, toys, cartoons, and other entrainment. There’s responsibility, family, friends and the wonderful memories that you can make with those that will burn brighter to you than anything TV or comics can give you. My family remains close, and even though my grandma left this world in 2003, her spirit is still felt everyday, with every memory of her living on strongly within me. I was really lucky to have someone in my life that lifted me in such a way, and I hope that everyone who reads this has someone in their mind that was there for them as well. We all deserve family we can hold close. I hold my family close still, with my mom, dad, sister and brother still in my life, along with new life to the family as my brother is now married with three children. I thank the powers that be for giving me this family. I will always cherish that which holds my life together. 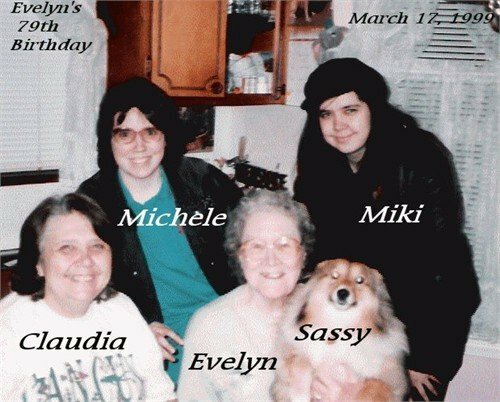 I speak now of my grandma in memory of her, today March 17th, 2011. She would of been 91 years old today and knowing her she would of had a big smile on her face wearing all green. I share now with everyone “Cowabunga Corner” #10 which has some footage filmed 20 years ago today. And Happy St. Patrick's day everyone else! Hope you’re wearing Green! This is so beautiful! Your grandmother sounds like she is a one of a kind person and I can see why you hold her dear to your heart. No matter what, a part of her will always be here with you and watching over you. Sweetheart, what are you trying to do, get me to cry so early in the morning, LOL. I miss her too, I did enjoy watching that video, brings back some memories. Your grandma sounds just like my grandma.We live in Oregon and she lives in Washington.I love her very much.